After numerous delays and hurdles, the shooting of the movie based on a popular novel by Subin Bhattarai, ‘Summer Love’ has started. The movie is expected to complete shooting in two months. The movie is going to introduce a well known personality in India in Nepali film industry – Rewati Chhetri. Rewati is one of the finalists of Miss India 2015. She had also won the Miss Popular and Miss Multimedia awards in the contest. 2013 – The novel was released in 2013. The novel was widely promoted and it became an instant hit. His book was reviewed by celebrities like Miss Nepal 2002 Malvika Subba and Miss Nepal 1997 Jharana Bajracharya. The book cover featured Prinsha Shrestha – the dethroned Miss Nepal Earth 2014. 2016, April – ‘Dreams’ actress Samragyee RL Shah agreed to act in the movie, verbally (Samragyee in the movie). 2016 – The film team started searching for the lead actress in the movie in Nepal and Australia. But, the effort was fruitless. 2017, August – Shooting starts. In the meantime, Bikash Acharya left the production team and started working with ‘Chhakka Panja 2’ team. The ‘Chhakka Panja’ actress, Namrata Sapkota, has signed in ‘Summer Love’. The movie to be made on the story of the popular novel by Subin Bhattarai, by the same name is being directed by Muskan Dhakal. In the movie, Namrata will be featured in the character of Sushmita. The lead actors of the movie were previously announced. The lead actors are new entry in the Nepali film industry – Rewati Chhetri and Aashish Piya. Namrata had previously signed in ‘Kanchhi’, the Shweta Khadka comeback movie. But, the movie was delayed because of Shweta’s social work to build houses for earthquake victim Majhi people. When the shooting schedule of ‘Summer Love’ clashed with that of ‘Kanchhi’, Namrata decided to leave it and work in ‘Summer Love’ instead. The artists of the movie are currently working in workshop. The movie is being produced under Nightingale Entertainment. The director, Muskan Dhakal had worked as the assistant of Bikash Acharya when directing the ‘Nai Nabhannu La’ sequels. He had also directed one of the sequels. Initially Bikash Acharya was supposed to produce the movie but later, Acharya decided not to invest in the movie. Acharya became the executive producer of the sequel of ‘Chhakka Panja’ instead. Rewati Chhetri to be Saya of Summer Love. Who is Rewati Chhetri? going to be featured as Saya – the character in popular novel ‘Summer Love’ by Subin Bhattarai. an Indian model of Nepali origin. Miss India 2015 finalist (one of the 21 contestants from all over India). is a law student and hoping to be a lawyer in future. Top 50 of Times Most Desirable Women 2015 with top Bollywood actresses like Anushka Sharma and Kangkana Ranaut. Yes – that is the new actress of the Nepali movie industry – Rewati Chhetri is. She is debuting in the movie made on the popular novel ‘Summer Love’. With a passion in dancing and acting, Rewati has also acted in a couple of local language films. A resident of Guwahati, India Rewati is an owner of a hot attractive and sensual figure and face who is interested in belly dancing. Starring – Priyanka Karki, Anubhav Regmi, Paul Shah, Aanchal Sharma, Barsha Raut etc. The fourth sequel of ‘Nai Nbhannu La’ was also a super hit movie like it’s previous sequels. The movie is the only Nepali movie that had been the fourth sequel of any Nepali movies. Produced and directed by Bikash Acharya, the movie features the music of Basanta Sapkota. The lyrics are written by Basanta Sapkota, Bikash Raj Acharya and Dr.Krishana Hari Baral. Script of the movie is written by Samipya Raj Timilsina, cinematography by Purushottam Pradhan, choreography by Kabiraj Gahatraj, editing by Arjun GC. The director of the 3rd sequel, Muskan Dhakal, is the chief assistant director of NNL 4. Summer Love delayed, is it due to the search of a cheap actress ? It seems, the movie to be made on the popular novel by Subin Bhattarai, ‘Summer Love’ is delayed. The reason for the delay is said to be the lead actress. The actress to be featured as the character Saya in the novel hasn’t been found yet. The film to be produced by the producer of ‘Nai Nabhannu La’ franchise, Bikash Acharya, was said to be directed by his assistant, Muskan Dhakal. The movie was initially announced in June of 2015. After almost a year later, ‘Dreams’ actress,Samragyee RL Shah was told to be featured in the leading actress’ role. Samragyee and the film team hadn’t however signed an agreement. Later, when ‘Dreams’ became a hit movie, Samragyee RL Shah reportedly hiked her price and the ‘Summer Love’ production team decided to search for another actress. In the mean time Samragyee RL Shah has signed actress Jharana Thapa‘s directoral debut movie ‘A Mero Hajur 2’ for a sum of Rs. 500 K.
It seems, the production team is penny pinching while searching for an actress. It is not a good sign that the producers couldn’t find an actress not only in Nepal but also in Australia. 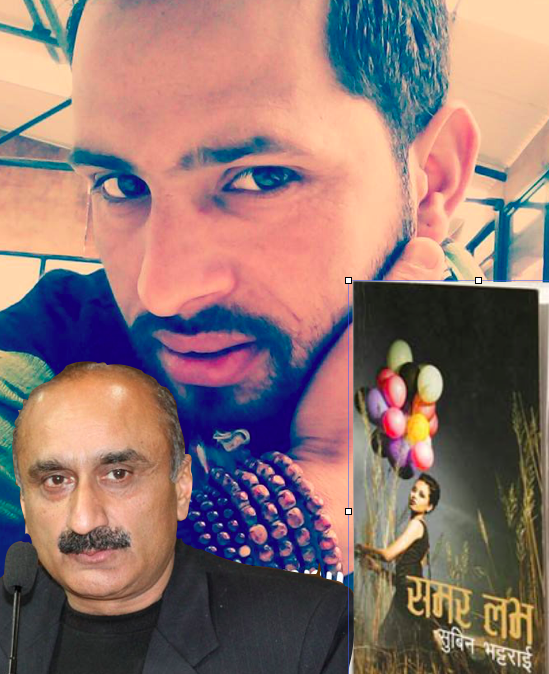 Well known director and producer Bikash Acharya has decided to make a movie on the novel ‘Summer Love’ by Subin Bhattarai. Bikash has contacted Subin and is negotiating to get into a reasonable deal with the writer. As Bikash Acharya will be busy in the direction of the fourth sequel of the popular movie ‘Nai Nabhannu La’, he has assigned the director of ‘Nai Nabhannu La 3’, Muskan Dhakal for the direction of the movie. The movie was recently released and was well received by the audience. The pre-production works of ‘Nai Nabhannu La 4’ is currently going on. Child actor Anubhav Regmi and Aryan Sigdel are the only artists finalized for the movie. The premier show of this week’s release ‘Nai Nabhannu La 3’ was held on Monday in Kathmandu. In the show artists, technicians and journalists were invited. There were positive reviewers of the movie. The movie is releasing on theater on April 10 along with Chhabi Raj Ojha‘s movie ‘Hawaldar Suntali’ and Nir Shah‘s movie ‘Seto Bagh’. In the premier the response Actress Rekha Thapa after watching the movie is linked to her ex-husband’s movie ‘Hawaldar Suntali’. Rekha rushed response to offer one of her future movies to the director Muskan Dhakal, left people wondering if she was pulling legs of her ex husband Chhabi. Rekha had hugged Muskan Dhakal and promised to make him the captain of one of her future movies.